How Do I Retrieve The Deleted WhatsApp Messages From Backup? As a hot and popular communication tool, WhatsApp has allowed us to contact with each other more conveniently via text and voice messages, sending images and videos or even update your status. However, some issues may occur like your WhatsApp messages gone for some reasons like accidental deletion, iOS upgrade and so on. Therefore, if you encounter such problem, do you think that it is possible to recover your WhatsApp messages? If you have backup, actually you do not need to worry about this, you can simply restore from your iPhone backup and it will be backed to your device. However, this is not really recommended, by restoring from iPhone backup directly, you will need to replace all your present data to the backed up data. Therefore, is that any way better than that? Let’s check below tips, this guide will show you how to retrieve Whatsapp messages from iPhone backup under the help from a powerful iOS data recovery tool. This professional WhatsApp data recovery tool is referred to iFonebox. With iFonebox, you could recover Whatsapp messages from backup from device directly or extract from iTunes/iCloud backup files. Besides WhatsApp messages, it do supports recover deleted WhatsApp audio messages and WhatsApp attachments. Therefore, if your WhatsApp data unfortunately lost or missing because of accidental deletion or whatever reason it is, you could get them back under the help from iFonebox. Other than WhatsApp data recovery, iFonebox is also designed for other iOS data recovery such as messages, contacts, notes, call history, Wechat data and so. To help you better understanding how to get back erased Whatsapp messages from iTunes, we have tutorial for you that explain how to retrieve whatsapp messages from iPhone backup. Before we begin, you’re required to download iFonebox on your PC or Mac. It is fully compatible Windows version and Mac version. In here, we’re taking Windows version as an example, Mac users also applicable for this tutorial too. 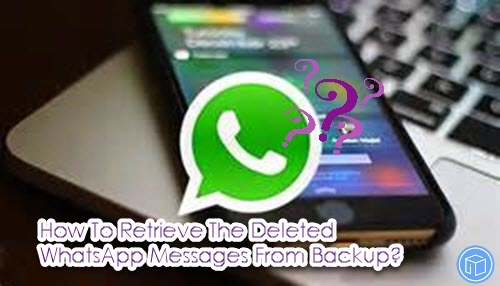 How To Retrieve The Deleted WhatsApp Messages From Backup? Launch iFonebox. 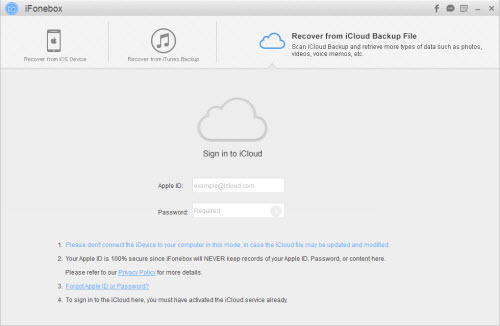 Choose Recover from iCloud Backup mode in the main interface of the program and then, you are required to sign in with your Apple ID and password. Remember to turn off your two step verification ahead. 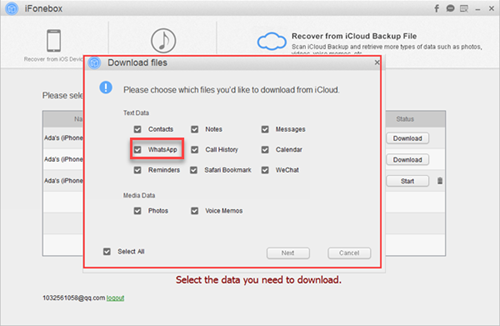 By now you should have the chance to select your iCloud backup file and begin the download. Download WhatsApp from iCloud backup. After you have selected the iCloud backup file to download, iFonebox will start the downloading process and in this process you can select only WhatsApp to download to save more time. 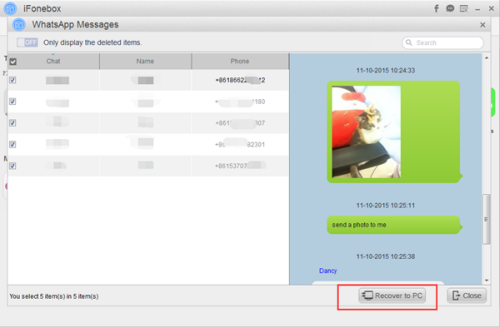 Scan & Preview deleted WhatsApp messages from downloaded iCloud backup. After finished download, you will be able to access and preview the erased WhatsApp messages from your iCloud backup. And now click “Recover to PC” button and transfer them to your computer directly. That’s all. It is actually quite easy to retrieve deleted WhatsApp messages from iCloud backup within the help from iFonebox, isn’t it? This entry was posted in iPhone, whatsapp and tagged iPhone data recovery, whatsapp messages recovery by IosdroneD. Bookmark the permalink.